In the previous post, we talked about the new way to exchange information with new friends through Poken cards. Just by ‘hi fouring’ by the two poken cards, we easily exchange all the information about the person we have just met. More over what attracts me the most about this little technology is that it is Green. No paper is required which means less trees to cut down. 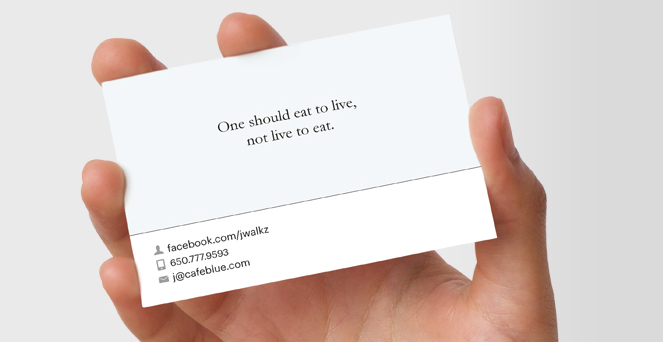 However, in the context of Facebook Timeline cards we go back to printing business cards but in a very creative way. Sadly, no more green.Nowadays, normally when we meet new people, we are no longer asked for our contact number, address, let alone email address instead it has become a new trend to know if we are on Facebook. 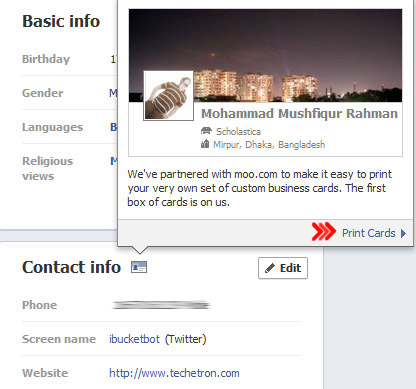 So why not create a Facebook Timeline business card ? Here is where Moo, a U.K business card company, plays it part. It has teamed up with the social network to create great elegant card designs based on the Facebook Timeline. So what’s the design and format of the card? 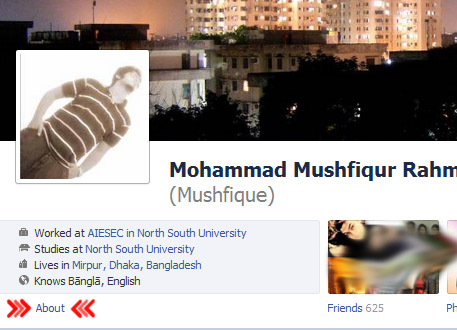 Exactly like your facebook timeline profile with the small square picture at the bottom left. 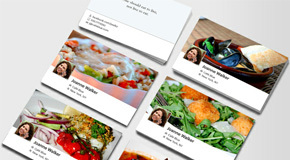 The design process allows you to to personalize the cards with the images that you have for your cover photos. At the front you have your name, where you work/study and your location and at the back you can add your favourite quotation, facebook profile URL, contact number and your email address. The best part of this offer is that it also gives you the opportunity to print 50 different photos for your card which means every card that you give out would have an unique picture. Sounds great isn’t it ? The pack of cards are printed on high-quality paper and for 50 cards it’s priced at $15, 100 cards at $30, 150 cards at $45 and 200 cards at $60. What attracted me the most about their service is that it is worldwide. There are packages available for delivery depending on how fast you want your cards. I have managed to place my orders all for free ! 😀 This really works! Just hope the cards are delivered safely to my place. Hurry and place your orders right now! If all the orders for the day is finished, no worries. Visit their site again at the time mentioned! 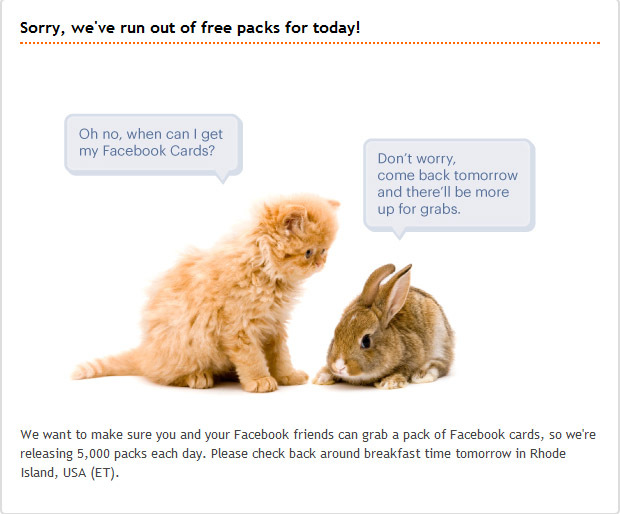 As Facebook has partnered with Moo, for the next 10 days they will be giving away the cards for free. It sounds unbelievable but yes! Moo is giving out these cards for free. Only the first 200000 people to sign up for the Facebook cards will get 50 printed cards anywhere in the world! It will take you to your facebook account for verification. You have to remain active in their site every hour to find if they have started giving out the free packs other wise you would face the situation shown in the picture below. Every day they have a limit of 5000 cards. Only lucky 100 people from different parts of the world ends up having their timeline cards all for free. GOOD LUCK to you and hope you are one of the lucky 200000! Nice idea and colorful too. As peole becom more familiar with timeline — this will be an advantage. Nice Idea… but I think I am keeping my bisiness card that looks like a "Google" search result" for my company… more identifiable and less "scornned" as Timeline is. Its really so nice card. This card i like so much. thanks for it sharing. Wow! Thanks for this info. I signed up and got the 50 free cards. They'll be delivered on the 25th. The cards look nice, good stuff. Wow this is so creative. I am gonna make a card like this right now! Hope you have ordered it Sheril! This opportunity must not be missed! Great looking business cards, will defiantly try one of those. 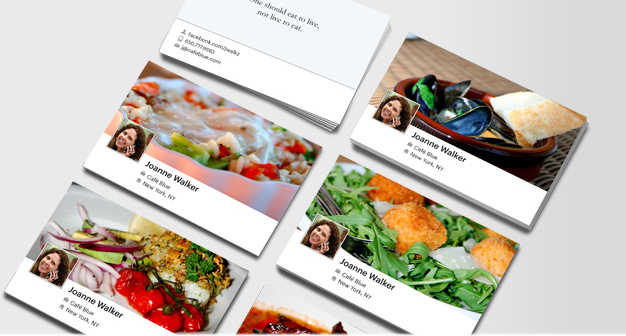 I like the idea of creating social business cards…nice. That's what I like about the design of these cards, simple yet very elegant! Thanks for your comment Sanjeev! Wow! this superb, totally signing up for one! Jason, I suggest you to go right now and sign up for one! The stock of 5000 cards per day might just end today any moment. Best of luck!